You carry around a document retention box filled with office supplies and tangled cat5 cables. Accountants go through these cables like candy. They are easy to misplace and constantly ‘borrowed’ by other accountants never to be seen again. 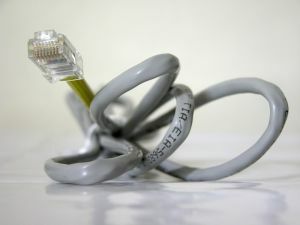 Cat 5e ethernet cables are the standard cables used for wired internet access. They’re ubiquitous yet hoarded by accountants who lose them in conference rooms, cubicles, and other workspaces. Even though Wi-Fi, 3G, etc. exist, accountants remain tethered to the internet through the office staple, the cat5 cable. You can even think of the laptop and cat5 cable as the accountant’s ball and chain. Besides fighting over cat5 cables, accountants must also battle it out for a much coveted spot in the router hub. When there are more accountants than available sockets, junior accountants have to sit in the conference room without internet. Not having access to the internet is extremely demoralizing for an accountant. Cat5 cables also make an accountant’s job hazardous. The ethernet cables working together with power cords, wind around tables and past chairs to trip accountants in the tiny little conference room. Because of the dangerous work environment, accountants are forced to tip toe about the room taking great care not to knock over binders, drinks, or workpapers. I have a half dozen boxes at home dating back to my apple IIe days. I don’t even recognize what they are anymore. Although generally hilarious… this entry was kind of weak. Can I get a BOOM goes the dynamite anyone??? How about team snack supplies and relentlessly insulting your coworkers..all in good fun……………do you hear it……BOOM goes the dynamite! My favorite ethernet cables are the red ones because they match my eyes after a 14-hour workday. How about referencing old fogey accountants/auditors telling stories of the old days when they shared a extra phone line to access the internet as you tell them from the 100th time how to change their TCP/IP settings and the VPN scripts so they can actually do some work.